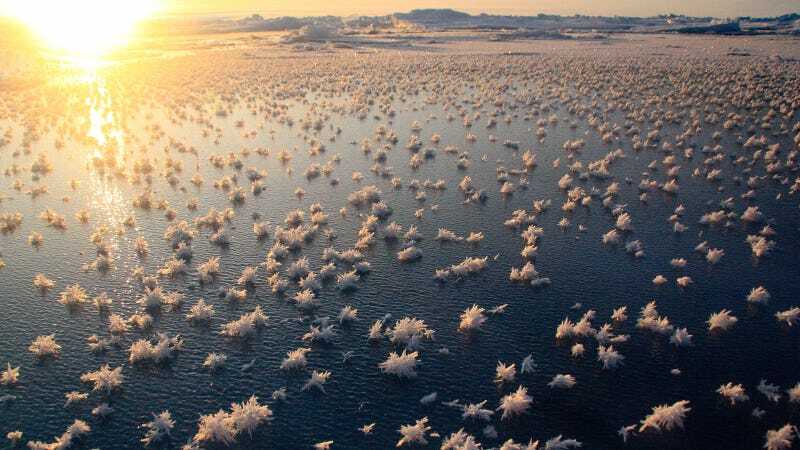 Did You Know that These Strange Fields of Ice Flowers Exist At Sea? This beautiful alien landscape is right here on Earth: a never-ending sea of ice flowers quietly floating over a thinly frozen sea. These strange ice structures are very rich in salt and bacteria—and very hard to pick, according to oceanography doctoral candidate Jeff Bowman. When sea ice forms during the polar winter it is often possible to observe the growth of frost flowers, intricate structures that are composed from frozen atmospheric moisture and from brine wicked from the sea ice surface. The transport of brine into these structures means that they are unusually salty, up to 5 times the salinity of the ocean. By this same mechanism other things in seawater concentrate in frost flowers, including bacteria. Although frost flowers are very abundant in the Arctic and Antarctic getting to them isn't easy. The ice underneath them is often too thin to walk across and prone to drifting with the wind. The basic sampling strategy is to find a place where the water is kept open by winds or currents (called a lead if smaller and short lived, polynya if larger and more permanent). 1) Calm winds. We can't have these beauties blown away can we? 2) Cold, cold air. It has to be about 20C less than the water and since seawater freezes around -2C, that means the air must be about -22C or -7.6F. BRRR. An ice flower grown in the laboratory.